Eight months after Britain declares war on German, the people of Brighton anxiously prepare for a rumoured Nazi invasion. The town’s piers are dismantled and barbed wire goes up on the beach. Soon vegetable seedlings will replace the flower displays in the parks and the lights of the fun fair will be dimmed. Already the racecourse has been transformed into an internment camp for whose people deemed to be ‘suspicious’. such as Otto Gottlieb, a German-Jewish artist whose work featured in the Nazi exhibition of “degenerate art”. In the Beaumont household, the preparations ignite underlying tensions. Geoffrey Beaumont is a banker charged with a secret mission to secure the future of the country’s currency by removing it to an undisclosed location, leaving his wife Evelyn and eight year old son alone to face the invaders. The only preparations he makes on their behalf involve a stack of cash and an envelope containing two cyanide pills buried in the garden, a contingency plan that in Evelyn’s eyes, amounts to a betrayal. The resulting tension between them escalates when Evelyn takes more than a close interest in Otto Gottleib and questions the treatment of the internees at the camp. It’s easy to see why Unexploded was long-listed for the 2013 Man Booker Prize. Macleod delivers a very persuadable sense of the period, rich in detail and atmosphere. Even though so much has been written about the lives of ordinary people at this point in Britain’s history; the anxiety of an unknown enemy, the constant rumours, the day to day trials of food shortages, the narrative often has a fresh feel. In one extended passage she describes how it would feel to be on the receiving end of a bomb attack. You are lifted from your bed even before you hear the blast….. You wake, unable to understand why heaps of gravel and brick dust are being shovelled over you at speed. You stumble outside for air, but even here the day is thick with dust, soot and – you can’t make sense of it – a blizzard of feathers. The immediacy of the present-tense approach coupled with her use of imagery made this one of the most memorable passages in the book for me. I also enjoyed her characterisation of the Beaumont’s son Phillip. As an only child his loneliness leads him to become friends with boys who would not be out of place in Lord of the Flies, to hide in corners listening illicitly to the radio, and to betrayal. Where the adults are simply frightened by the prospect of Hitler’s arrival, Philip’s reaction is more complex. It starts as a game, an amusing diversion, but then things happen that although he doesn’t comprehend fully, he still recognises as disturbing and wrong. Change was creeping under the door and through the windows of their home, persistent as gas … It was gathering over the house in spite of the purity of the day’s rinsed blue sky. It was spiralling down the flue. At night as they slept, it would settle over their hearts. A good story; well-written prose; lots of simmering tension, strong characterisation and meticulous attention to detail: it would be hard to find much about this book not to enjoy. Unexploded was published by Hamish Hamilton in 2013. 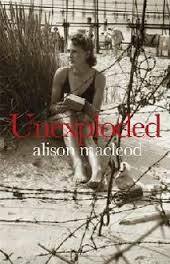 Alison MacLeod is a professor of contemporary fiction at the University of Chichester in the UK. Raised in Canada she has lived in England since the 1980s. This is her third novel. Posted on March 29, 2014, in Book Reviews and tagged Alison Macloed, Man Booker Prize. Bookmark the permalink. 8 Comments. This sounds good. I really enjoyed the TV show, Foyle’s War, so this would fit with that experience. I hadn’t made that connection Joy which is rather surprising since I’ve been watching Foyles War this past few weeks. But yes the two would go together well. Sounds like a very, very good book. I will look out for this, for sure. I just learned that it is the Book at Bedtime on Bbc radio 4 this week Nish. I don’t know if you can get that but take a look around the bbc radio site. Episode 1 is still available until the end of the week. I’d like to read this and make comparison with the new Clare Morrall book. This sounds as though it might have rather more depth. I love the sound of this one, great review.